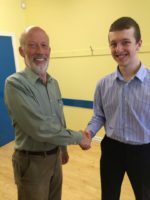 Scott Moore of Strabane Academy is pictured with Alliance leader David Ford. The Alliance Party has backed allowing students over 16 or in Sixth Form to opt themselves out of prayers in assembly without the need for parental permission. Write to or email your MLA, asking if he/she will back a self opt-out for post-16/Sixth Form students.